The Miss Universe pageant is on this January 30 at the MOA Arena. The press conference of the 2016 Miss Universe pageant has just wrapped up at the Malacanang Palace. The pageant’s coronation night will be on January 30 at the Mall of Asia Arena. 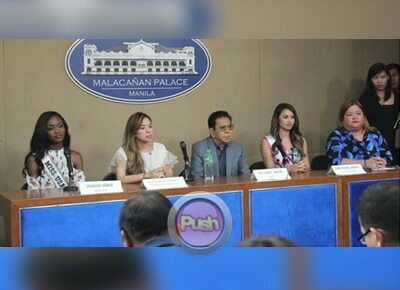 Part of the panel include host committee chairman Richelle Louise Singson-Michael at Luis Chavit Singson, Department of Tourism undersecretary Kat de Castro, Miss USA 2016 Deshauna Barber and Miss New Zealand 2016 Tania Pauline Dawson. Various government agencies also expressed their support to the prestigious pageant. This is the third time the country will be hosting Miss Universe – first was in 1974 and was followed 20 years after in 1994. A grand kick off ceremony will be held tomorrow, December 10, at the Director’s Club in S Maison of the Conrad Hotel in Pasay. Reigning Miss Universe, Pia Alonzo Wurtzbach, will be present at the event with 9 official candidates from various countries, namely Thailand, Malaysia, Myanmar, Korea, USA, Australia, Indonesia, Japan, New Zealand and Philippines. A lot of pageant fans are happy with the advanced arrival of the candidates and Bb. Pilipinas- Universe Maxine Medina said she will gamely take on the role of tour guide for the other contenders.